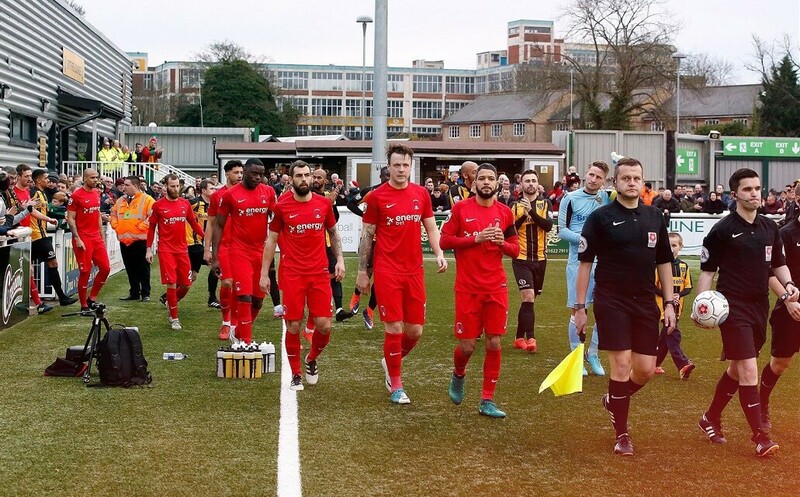 Leyton Orient made the short journey into Kent and came back with all the apples in England’s Garden of Eden as they beat Maidstone by a two goals to nil scoreline that gives them a little breathing space above the relegation zone in the National League. That’s two wins from two from Justin Edinburgh’s east London boys and they look as if Edinburgh in his short term in charge has already instilled some self belief in a team that remain in 20th position in the table. However they have pulled away from the bottom four and there is a gap of six points between them and 21st placed Chester City now. Leyton Orient look as if they have a bit of bite in them and appear rougher and tougher around the edges something that has been desperately lacking for the last four months. Indeed they seem to have more bite going into the tackle as four players found themselves in the referees book for the O’s. Lawless, McAnuff, Bonne and sub Harrold all made Chris O’Donnell take out the yellow card as the O’s were superior to Maidstone in hunger, attitude and appliance. This is the first time Leyton Orient have won back to back matches in the National League since September and a cracking attendance of 3,325 saw the home team cave in to an at times inspired Leyton Orient. Maidstone reverted to 4-3-3 for the visit of an Orient side who were out to impress new boss Justin Edinburgh. The former Gillingham manager Edinburgh tasted victory on his return to Kent. Dayton, Mooney and Bonne all started for the O’s in an attacking formation with Dayton again having a really decent outing. Indeed Orient took the lead in the 36th minute when Bondz N’Gala tapped home James Dayton’s in-swinging corner to grab his first goal for Orient as the visitors went into the break with a goal advantage. Macauley Bonne doubled their advantage at the start of the second half after Jake Caprice found the striker, who turned and slotted into the bottom corner from inside the area. Joe Pigott spurned a decent chance from a free-kick for the hosts but Orient held on for a valuable win to move them six points clear of the relegation zone. Maidstone’s winless league run stretched to five matches after losing to Leyton Orient and although United tried and tried they simply couldn’t find a way back against a resolute Orient defence. This was Orient’s first away win since August and the 600 O’s fans know that this victory to earn a valuable 3 points was better than a night out on the town with a red nosed Santa and a herd of inebriated reindeer. The first opportunity fell to the visitors with Josh Coulson heading over after the second ball fell his way from Jobi McAnuff’s free kick, while David Mooney side footed wide after linking nicely with Craig Clay on the edge of the box. For the Stones, Jai Reason went close after a one-two with Joe Pigott and Alex Finney’s header from a Joe Anderson free kick was held before Jamar Loza intercepted on halfway, exchanged passes with Pigott and ran in on goal only to fire wide when well placed. Orient took the lead when N’Gala had one effort from James Dayton’s inswinging corner and while there were enough Stones bodies around to clear, the O’s defender managed to bundle home the loose ball. It wasn’t the best goal you’ll ever see but precious for the O’s. Leyton Orient doubled their lead in the 52nd minute when Mooney fed Jake Caprice up the right, with Bonne turning on the defender’s cross and finding the far corner. Maidstone had a big penalty shout turned down soon after, Reason’s clever back heel setting up Sam-Yorke who was bundled over by Coulson. Sam-Yorke then headed over before Pigott’s excellent 25 yard strike was held by Brill for the O’s. Substitute Aaron Collins could have pulled one back for Maidstone from Hines’ cross but put the ball over. Fancy a bet on Leyton Orient then why not checkout the following link.